How can RDA Outputs help me solve my data sharing challenges? Home » News & Articles » How can RDA Outputs help me solve my data sharing challenges? The RDA Working and Interest groups work hard to develop outputs that provide technical and social solutions to solve data sharing challenges globally. These outputs are of great value to a wide range of organisations and individuals that deal with research data. Not all stakeholders are aware of these valuable assets that the RDA community has to offer freely. A task force has been set-up to support the RDA community in promoting the uptake of its outputs globally and cross-domain. This recently formed Global RDA Adoption Team aims to widely promote the uptake of RDA outputs among stakeholders in all its regions and domains through training, improving the visibility of outputs, the sharing of adoption stories and stakeholder engagement at RDA plenary meetings. Anthony Juehne, member of the Global RDA Adoption team, will give an overview of the outreach and training work that the recently formed team is setting up with the aim to promote the uptake of RDA output globally. Oya Beyan (RWTH Aachen University) will explain which challenge the recently formed Reproducible Health Data Working Group will be addressing in the coming 18 months. Mark Musen will tell the adoption story of Stanford BMIR and Center for Expanded Data Annotation and Retrieval (CEDAR). 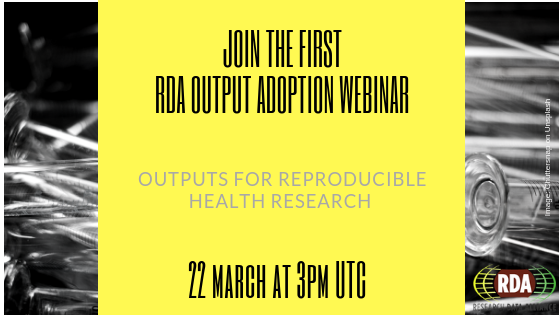 The webinars aim to raise awareness on RDA, its added value and outputs, to finally promote adoption. The series is aimed at Domain Scientists, Data Experts, Research Infrastructures, Service Providers and Citizen Scientists. This first edition is specifically interested in all involved in Health Research.